Baby full moon, say it in fusion way. 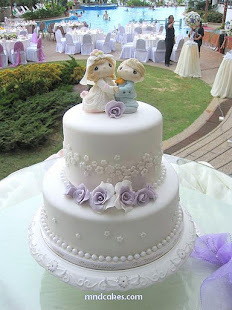 Nowadays, younger generation likes to be different but not to sacrifice the tradition. 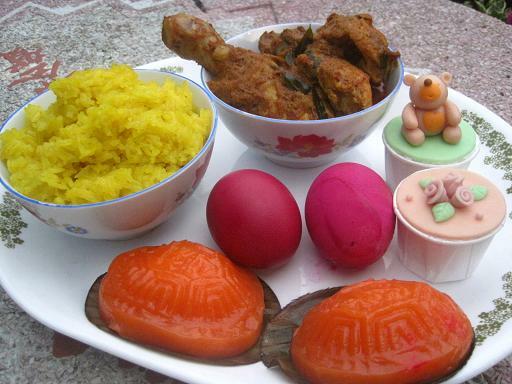 Here a friend of mine has commisioned me to make her baby girl's full moon gift by combining the custom kunyit rice, curry chicken, ang koo and red eggs with 2 pieces of fondant cupcakes. Since the baby is a girl, I made roses besides the universal Lovey Bear for her. If you'd like to have this fusion package for your baby full moon too, email us at mndcakes@gmail.com or call Amy at 0164011319 for more details. Thank you. Please send me the fullmoon packages and price list. please send me the price list package of the fullmoon. Hi, please send the fullmoon package pricelist to siowhoay@hotmail.com.